Before I had kids, I was as easy-going, happy-go-lucky as they come. Anger wasn’t a part of my life really. I could even keep from getting mad at people who cut me off, that’s how laid back I was. Life was so simple then. I remember seeing parents losing it with their kids and thinking lots of judgmental thoughts about their lack of ability as a parent. I would shake my head as I passed by thinking about all the helpful advice I could give them if they would just listen. I was a Family and Human Development major, after all, so I was pretty much an expert. Fast forward 15 years and 5 kids later. My Family and Human Development diploma is collecting dust while I’m living out the daily realities of developing a human family and realizing everyday that my little judgmental-college-student self didn’t have a clue. And, certainly, though my degree has been helpful in some ways, it could no way prepare me for all the scenarios that would play out in my life as a parent. For instance, I was completely shocked to find out that there was a bit of a monster living inside of me that I didn’t even know existed until I had kids and he reared his ugly head. A monster that gets angry and frustrated and wants to yell at little humans who whine and ignore me. Nothing seems to bring the monster to the surface faster, though, than when my kids are fighting with each other. I’ve come up with a theory for why this is so. You see, as a mother, you have a built-in instinct to protect your young. This includes a desire to destroy anything or anyone that is hurting your child. So, you can imagine the inner conflict when you witness one of your children hurting one of your other children. You want to simultaneously protect and destroy these little humans! It is very confusing for your heart and brain to figure out an appropriate response when the adrenaline that shoots into your system drives you to act swiftly to save your child. When they are both hurting each other, it compounds the confusion even further. And because a fight between siblings is usually quite a loud affair, you end up yelling both to be heard and to release the adrenaline pumping through your body. I hate getting angry. It is not who I am or who I want to be anyway. I want to stay calm and collected and unemotional like they tell you to, but that is sooo much easier said than done. Have you ever had 5 little people surround you like a swarm of bees, 2 of them screaming at the top of their lungs, while 2 of them argue why it is the other persons fault and another is just telling you over and over again that they are hungry? It is enough to make you want to run off screaming into the night. Kids are amazing, and wonderful, and hilarious, and they melt your heart. But they are also the most trying creatures on the planet at times, and learning how to deal with them is an individual process for each child, because they are all wired a little differently and respond to different parenting approaches. How my kids respond to my anger is a great example of this. One of my daughters, who is a pleaser, will immediately do anything she can to diffuse the situation, while another, who is a bit of a sassy pants, will get right in my face and yell back. The point of it all is, of course, that none of it is healthy or good for our relationship, and so I am always trying to find ways to eliminate yelling from our home– from me and from my kids. I saw a meme on Facebook with a quote that I love. It said, “When little people are overwhelmed by big emotions, it’s our job to share our calm, not join their chaos.” (-L.R. Knost.) I read that and thought that is profound and I stink at that. I thought about all the times I have joined in their chaos instead of sharing my calm… maybe because my calm disappeared when the mama bear showed up, but really, I’m the adult here, right? I can’t expect them to keep their emotions in check if I can’t even keep mine in check. Man, parenthood can be humbling. So, I’m always working on it and I go through stints where I do better than at other times. So, many things can throw you off your game as a mother. Being pregnant and sick or exhausted, having a newborn and being exhausted, having a sick kid who is up all night and being exhausted, (so much being exhausted!) marriage difficulties, financial stress, losing someone close to you, and if you are a working mom it all gets compounded because you always feel like you are running behind and there is no way to get ahead or even caught up. And bless our kids’ hearts, they get us however we are- and we are all they’ve got. All the parenting classes in the world are awesome in theory, and yet the principles can be so hard to apply when you are compromised and vulnerable or caught of guard as a parent. They don’t actually teach a course for what to do when your 18-month old who was supposed to be sleeping was actually painting your entire room with the contents of her diaper. Or on how to deal with children fighting like dogs in the back seat of your car while you are driving down the freeway. You just get to deal with that stuff on the fly and sometimes you are going to be awesome… and sometimes you are not. So, when I’m not, I try to apologize to my kids. I try to talk to them about how we both messed up in whatever our latest interaction was and how we can do better next time. Because, you know what? I’m not the perfect parent, and I’m never going to be the perfect parent, but maybe by showing them that we all make mistakes and we can apologize and try to do better next time, they will realize it is okay that they aren’t perfect either. And we can all be a work in progress and help each other make progress along the way. Really, that is what a parent/child relationship is all about, right? We help them grow, and they help us grow. If they never brought out that monster inside us, how would we ever know it was there and needed to be rooted out? One of my daughters has shared some particularly profound thoughts with me on occasion- sometimes my kids blow me away with the maturity of their thoughts and ideas. The other night we were having a family discussion about how we could do a better job keeping a peaceful spirit in our home and stop fighting with each other so much. 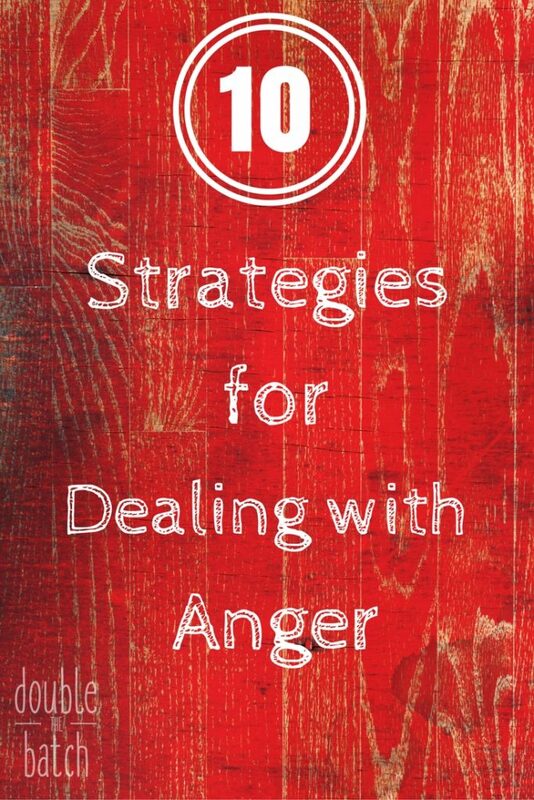 I noticed she was busily writing during our discussion and afterwards she brought me a list she had written and titled “10 Strategies with Anger.” It was a pretty solid list from a 10-year-old, so thought I would share it with you. 1- Walk away and cool off. 4- Put yourself in the other person’s place, and if you don’t know why they feel a certain way, ask them. 5- Think about what you are fighting about. Is it silly? Stop fighting and start laughing. 7- Don’t say anything offensive. 9- Don’t use words you’ll regret in the future. I love her. I want to be like her when I grow up. Now, she, of course, is not flawless at putting these principles into practice any more than I am, but I am glad they are in her head and can guide her interactions when she will let them. And I am glad they are in my head now to remind me of better ways to deal with my anger when my kids push me to the edge. I’ve been thinking about our country this election season and how we’ve kind of become a great big dysfunctional family. I have definitely played a part in this as much as anyone else. It feels like we are constantly getting in fights that quickly escalate to the point that we are yelling at each other. Our ideologies are like our children- they are precious to us- and when they are attacked, our mama bear comes out. And I know for me, when I get to the yelling point, I’m only thinking about myself and how right I am and how I’ve been wronged. I’m not listening to what the other person is saying. I just want to drive my point home and win the fight. I make rash decisions in the heat of the moment that I regret later. I think it is fair to say that we are suffering from an epidemic in this country of not feeling listened to or understood. We’ve become so quick to label each other and lump each other into categories that we can’t see how similar the majority of desires of our hearts are. The vast majority of us want what is best for America, what is best for our families, and we care about our neighbors. We may disagree on what is best, but we all want the best. We’ve all had different journeys and experiences that give us our own unique perspective on what is happening in the world and what needs to be done to improve it. We could probably learn a lot from each other if we stopped yelling. In fact, It’s possible that the most helpful thing we can do at this point in our nation’s history is start really listening to each other. To try and wipe away our preconceived notions about people who perceive things differently than we do, stop using labels, and try to really understand where they are coming from. To practice having respectful dialogues with each other instead of yelling matches. We will probably still disagree on many things, but at least we will all start feeling more understood, and that alone diffuses so much anger and tension. And if we can start to better understand each other, instead of making rash decisions out of a desire to be right or get revenge, maybe we can start finding some actual solutions to this country’s problems that will help us heal. So, that’s where I’m at. I just want to stop yelling and start being a better listener. A better listener at home with my kids. A better listener with my family and friends. A better listener with the people I don’t generally agree with. And I want to teach my children how to listen and offer others the gift of understanding, instead of teaching them how to win a yelling match.